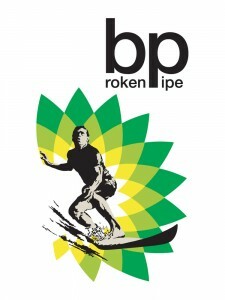 The rabblerousers at Greenpeace know that a company’s logo is sacrosanct — it’s the brand’s visual identity to the world. That’s why they’ve decided to hit BP where it hurts. 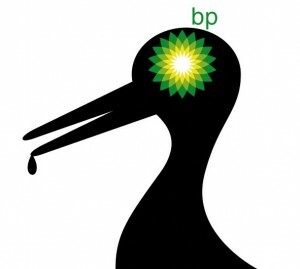 With a new Web site calling for public submissions, Greenpeace wants graphic-design-savvy activists to reimagine the lively green-and-yellow BP logo in the wake of the catastrophic Gulf of Mexico oil spill. An entire set of the entries thus far is up on Flickr. We’re especially fond of the sad bird (above), the surfer riding a wave of oil (below). Greenpeace’s bone to pick with BP — beyond the obvious “you’re guilty of the worst petroleum-based disaster since the Exxon Valdez spill” — extends to the issue of tar sand drilling, a practice that the organization says will lead to environmental and human-health catastrophes in Canada. And the environmental group isn’t limiting their graphic offensive to Flickr: Earlier this week Greenpeace operatives scaled their way onto the balcony of BP’s London headquarters and swapped the company’s official flag with their own oil-smeared version, complete with an update of what the energy giant’s acronym stands for: “British Polluters.” See a video of the intervention below.